Select United States (for country) and US English (for language). Select “Business” account. Follow the process outlined in the next page, it’s a three-step process that takes a few days to verify your bank account. Be sure to send an email to info@registernation.com when your Paypal account is set up so we can make sure you get the discounted transaction fees. Login to Paypal, and from the “My Account” tab click “Profile”, then “My Selling Tools”. Under “Getting paid and managing my risk”, update the “Instant payment notifications” section. Make sure IPN is turned “On” and use the following for the Notification URL: http://yourdomain.registernation.com/n/ipn.cfm. Go back to the “Profile” page. Click on the “My Selling Tools” link on the left, then click “update” for “Website Preferences” (this link is in the “Selling Online” section). Set “Auto Return” to “On” and use the following URL: http://yourdomain.registernation.com/n/paypalprocess.cfm. Scroll down to the “Payment Data Transfer” section and turn it on. Once you save this information, you should see your “Payment Token”. Copy that token– you’ll use it in the next step. Save all of your settings and login to your Registernation account. Under “Manage Business Info” (at the top of every page), scroll to the bottom and enter your PayPal email address and the Token you received in Step 4. Make sure the “Online Payment is ACTIVE” and “I am Open for Business” boxes are checked once you’re ready to go live. It’s also important that you use the PRIMARY email address on your PayPal account for the “Payment ID” field in Registernation. Finally, test the registration process from start to finish. Create a “test” camp or event that costs $1 and register for it. 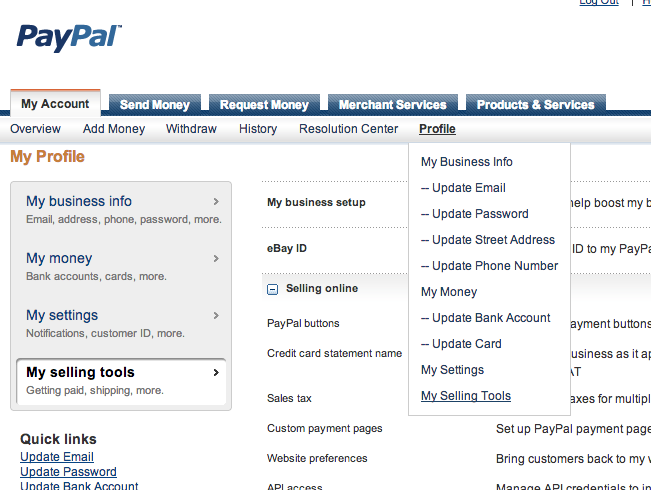 Make sure you get passed onto Paypal correctly and the registration shows up when you login to the admin dashboard. As always, if you run into problems, email or call and we’ll help you out!